There is a bit of a chill in the air now, fall is rapidly approaching, and farmers markets are becoming a bit more sparse… of course there is still plenty of fresh produce to be had! As quinoa is a really magical food — a legendary complete protein — I needed to find suitable companions for it. 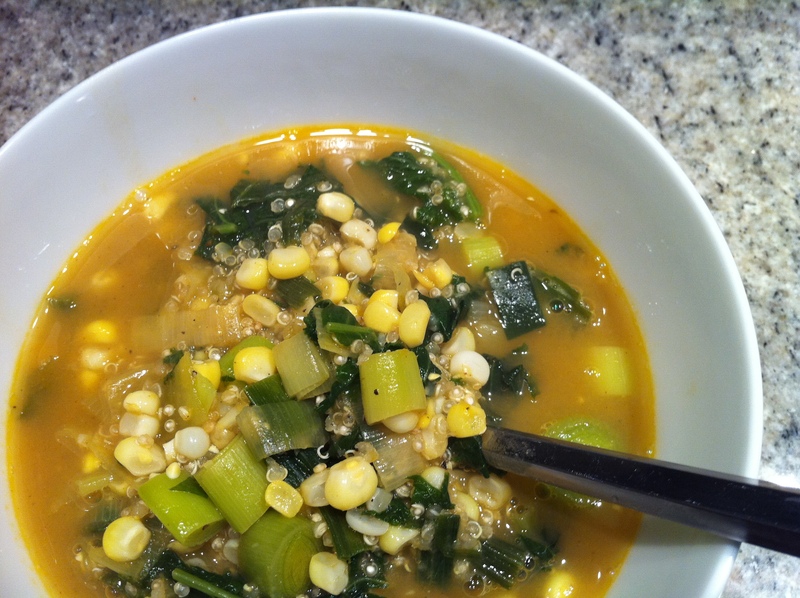 I settled on kale (another superfood), corn (since I can’t get enough of it), and leeks (they looked too good to pass up at the farmers market). I would chuck them all into a hearty end of summer soup. Slice the leeks in 1/2 inch rings, white AND green parts, then thoroughly wash them – lots of sand/dirt gets stuck between their leaves! To quote Ina Garten: “There’s no sense in making soup if its full of sand!”. 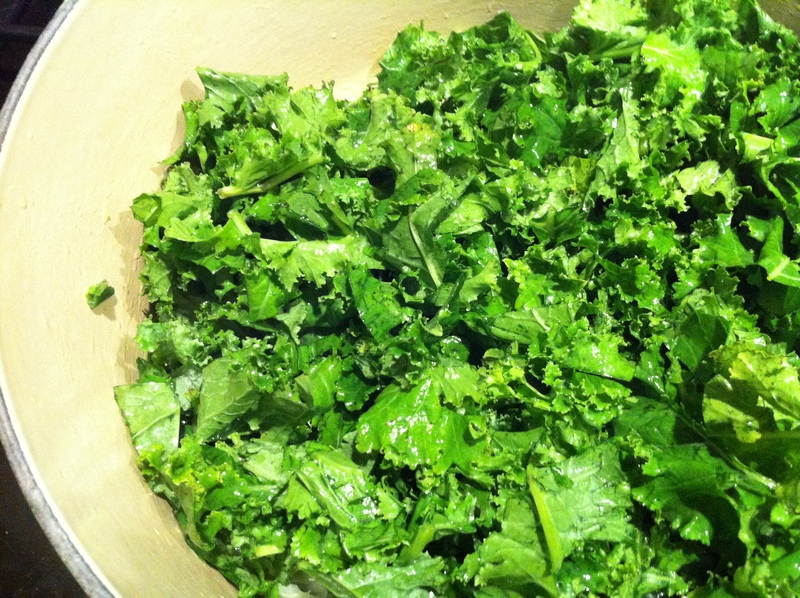 Remove the thick stems from the kale and give the leaves a rough chop – thoroughly rinse this as well. Then husk the corn and slice off the kernels. In a large heavy-bottomed pot (such as le Creuset), heat up the butter and oil. 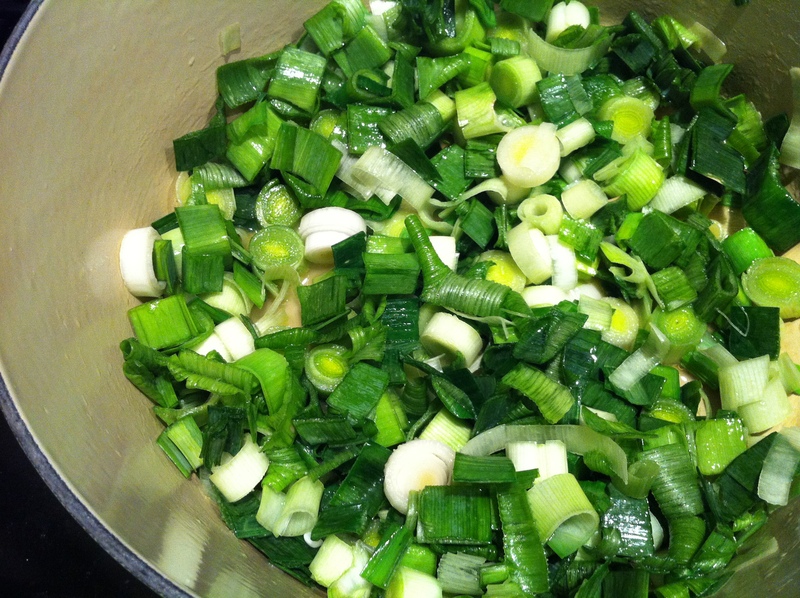 Add the leeks and saute until they are soft. 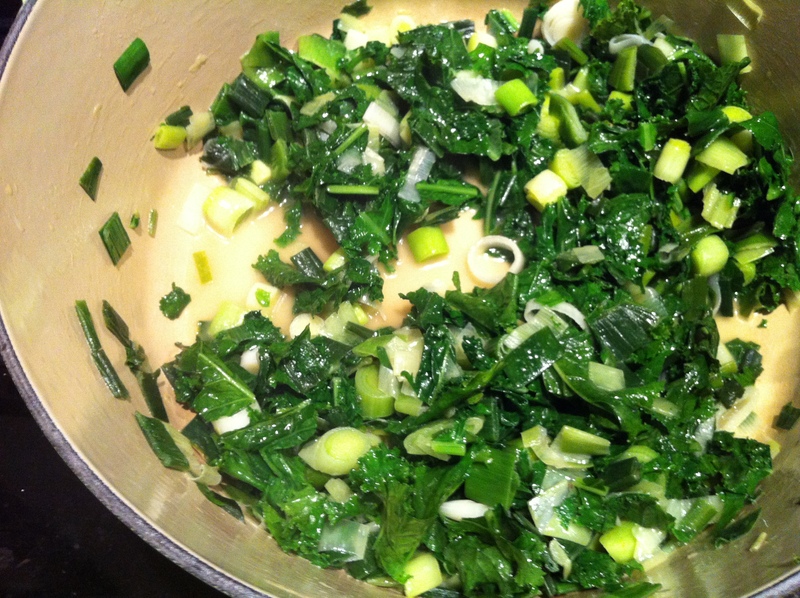 Add the kale and saute until wilted – it is crazy how much kale cooks down! 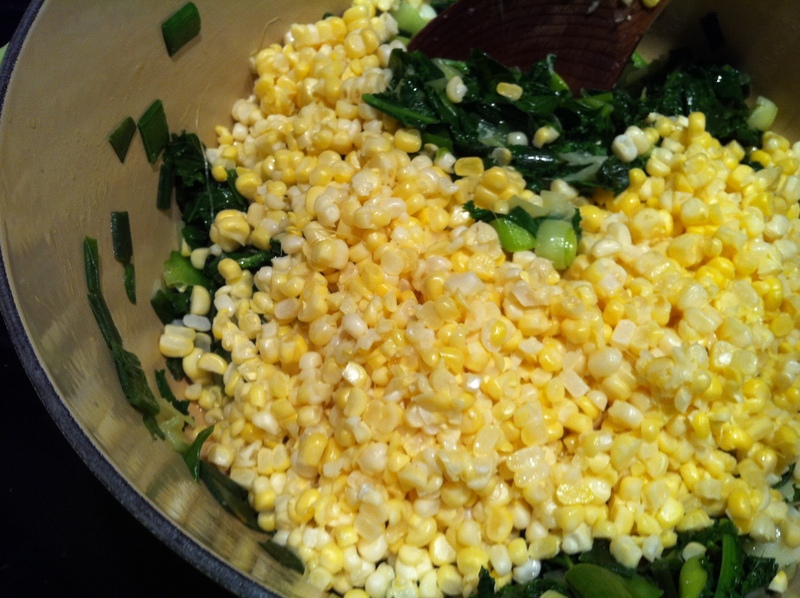 Then add the corn, saute for just a minute or two and add the stock. 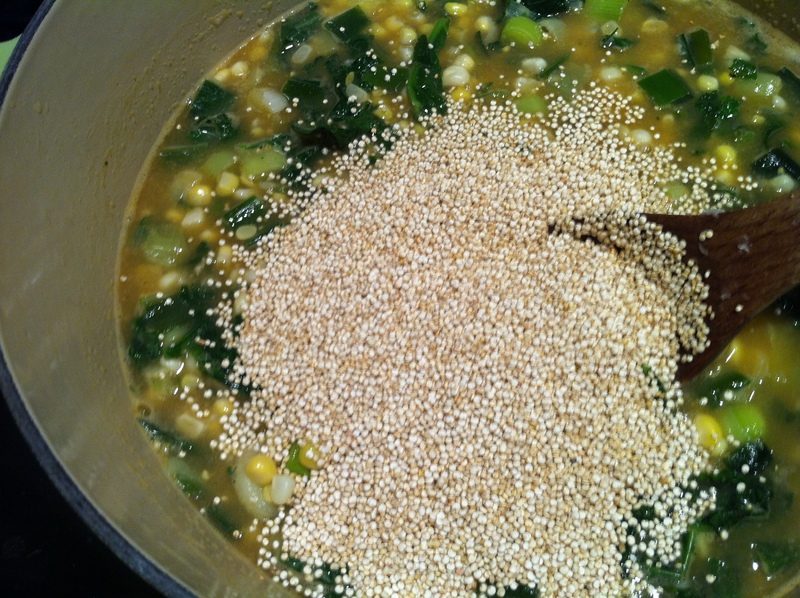 When the stock reaches a simmer, add the quinoa. Let this simmer away for a good 15 minutes, adding the coriander, chili powder, and seasoning with salt and pepper to taste. I put a few steamling ladlefulls into a bowl and chowed down — delicious, nutricious, and VERY filling. When I looked back at the pot the quinoa had sucked up a little more liquid — it turned from a soup to a stoup. All the more hearty. 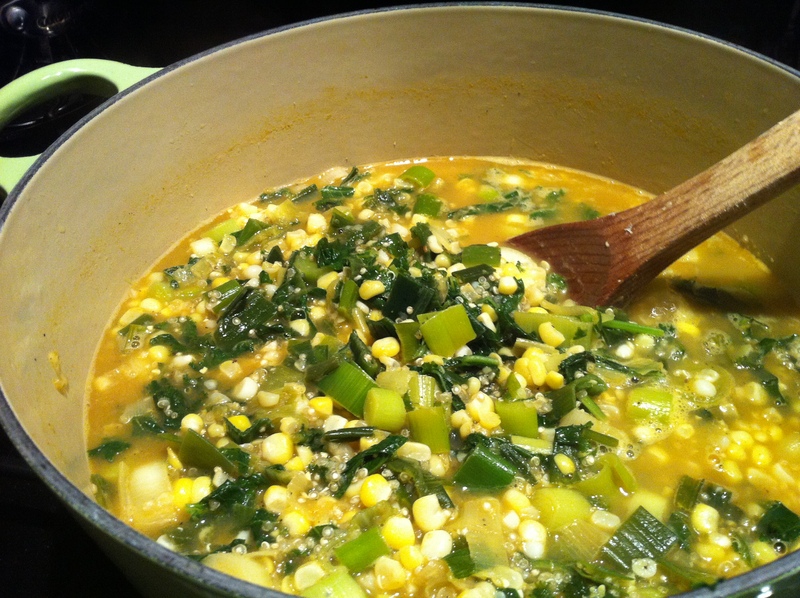 This entry was posted in Corn, Farmers Market Finds, Local Food, Quinoa and tagged corn, kale, leeks, quinoa, soup. Bookmark the permalink.